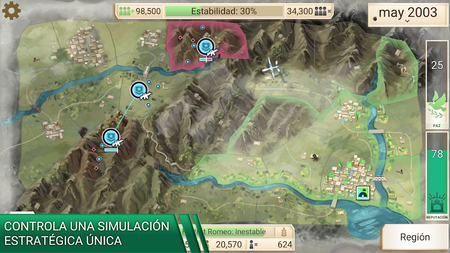 Rebel Inc. comes to Android, the new simulator strategy from the creator of Plague Inc.
With more than 100 million players, Plague Inc. became one of the best games of strategy & simulation. Now its creator wants to repeat that milestone with their new game, Rebel, Inc. The spiritual successor of Plague Inc. came to iOS last December, but two months later we can already download Rebel Inc. from Google Play. Rebel, Inc. repeat formula to give us another great strategy sim, but instead of trying to smother humanity with a virus, in this new release, we have stabilize a country fresh out of a war. 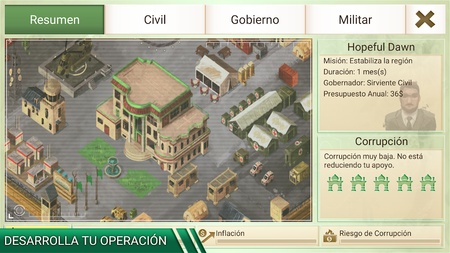 In this strategy game we’ll have balance the priorities of military and civilian to win the confidence of the citizens and prevent the insurgents from taking power. To do this there will be stabilize through its six governors with different skills five regions using innovative tactics of counter-insurgency and fund initiatives realistic to empower the local government. All in a world that is highly detailed, with algorithms narrative tactical and sophisticated with a lot of AI. Rebel, Inc. is a free download with in-app purchases Their micro-payments will allow us to unlock cheats, characters, and regions that will help us to advance in the story. The game is not require an Internet connection to play. The news Rebel Inc. comes to Android, the new simulator strategy from the creator of Plague Inc. was originally published in Xataka Android by Cosmos .